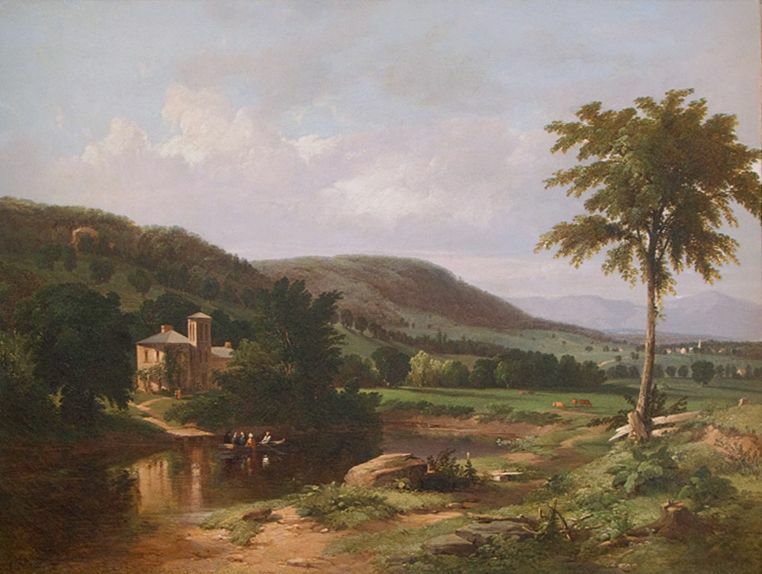 Summer Idyll in the Hudson Valley is a rare and very early example of the pastoral landscapes for which William Hart became well known. Dated 1849, it was painted while the artist was still based in Albany. Few paintings are known from the period prior to his move to New York City in 1853, though he exhibited at the National Academy of Design as early as 1848. 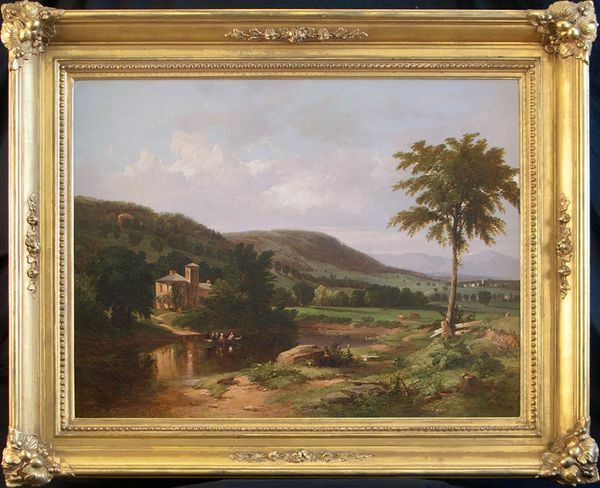 In 1849, Hart exhibited two paintings at the American Art Union, Scene on the Helderberg Mountains and Distant View of Albany, both of which are comparable to Hawthorne’s painting. In each of these 1849 works, Hart pictures the Hudson River Valley as a Claudian Arcadia with grazing cattle, lush pastures, rocky outcroppings, meandering rivers, and figures at rest. This view of America as a New Eden was popularized by the American Art Union, which promoted and disseminated works by young American landscape painters such as Hart, John F. Kensett, Frederic E. Church, Jasper F. Cropsey in the 1840s and early 1850s. Contributing to the picturesque quality of Hart’s Summer Idyll in the Hudson Valley is the Italianate villa nestled within a group of trees at the water’s edge. Beginning in the 1840s “Tuscan” villas such as this, with their distinctive low-pitched roofs, wide overhanging eaves, narrow arched windows, and corner towers, were built throughout the Hudson River Valley, replacing the Federal style mansions of the previous era.